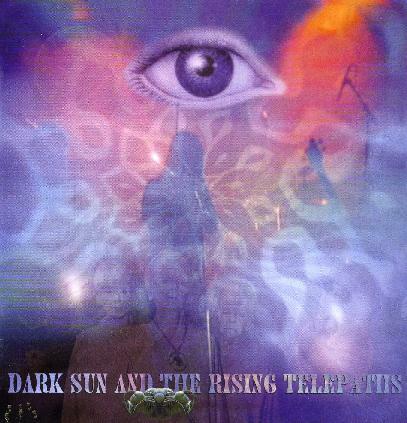 Dark Sun and the Rising Telepaths - "Astral Visions II"
Dark Sun is back with their second archive release. This includes mostly soundboard recordings of live concerts from 2000-2005. It is limited to only 150 copies and has some amazing artwork. Nik Turner from Hawkwind is featured on a number of tracks. The band has always played a lot of Hawkwind covers in their set but in my eyes the best material on this CD is the original songs. The first CD begins with a very spaced out electronic piece that goes into Tobor, quite an upbeat original track not on any of the bands albums. Next up is the Chrome track, Heart Beat. A cool version. The oldest song from the bands catalog, Black Spires, is next. Man, this stuff is really great and shows how amazing and underrated this Finnish band is. Next is a long version of Psi Power. Iskariot, one of the bands best unreleased tracks is next and you get to hear the band space out! A pretty far out version of Brainstorm is next and this goes into 9 minutes, a very melodic space rock track. Crimsonaut, another new song and one of the ones recorded from the audience but with good sound. I like the organ and quite funky space groove on this track. A pretty cool (but less than perfect) version of Motorway City, from what sounds like the same gig is next. I had never heard them play this track before. The CD ends with the amazing Dream Circuit! Ready for another 70 minutes?? CD2 begins with 4 tracks from the soundcheck from a gig with Nik Turner in Helsinki, where the actual recording did not turn out so all they had was the soundcheck! It is interesting to hear Nik perform the Pink Floyd track, Set the Controls for the heart of the Sun and then the Hawkwind tunes, Master of the Universe, D-Rider, and Orgone Accumulator. The best music begins after with Electrified! This soundboard recording is really excellent.. Our Man Inside, another old classic is great to hear! Next up are 3 covers songs - Lucifer Sam (Pink Floyd), Pictures in my Mind (Magic Mushroom band and sung by Santtu! ), and My White Bicycle (Tomorrow). All are performed extremely well but the take on Lucifer Sam is really cool. Not sure why this Welcome Jam was included as it does not really fit with the rest of the stuff on the CD?? Anyway, two more unreleased original tracks (Stow Away and Zenith) and two more Hawkwind covers, Zarozenia and Psychedelic Warlords, end this very cool and professionally put together rarity. Remember only 150 copies! Great space rock stuff. For more information you can visit the Dark Sun web site at: http://hop.to/darksun.